For his second outing People...Hold On (1972), former Temptations leader Eddie Kendricks expanded his horizons, dabbling with communally conscious soul and making initial forays into dance music that would predate disco. As he had done for Kendricks solo debut All by Myself (1971), producer Frank Wilson contributes several tunes. Among them is "If You Let Me" that kicks off the disc with a bright groove, custom-made for the vocalists' sanguine lead. Things get downright funky on the sanctified "Let Me Run into Your Lonely Heart." The mercurial beat is bathed in distortion and wah-wah guitar that trades back and forth with a syncopated clavinet. All the while, Kendricks shows off his range-free tenor as he effortlessly vacillates in and out of his trademark overdrive falsetto. The sacred influence of "Day by Day" is underscored by some stellar keyboard with organ and piano runs that could just as easily have been heard in a Sunday morning prayer meeting. The nearly eight-minute "Girl You Need a Change of Mind" is nothing short of an epic precursor to the extended four-on-the-floor numbers that would soon be christened as "disco." In addition to providing an above average R&B groove, Kendricks' new band -- the Washington D.C.-based Young Senators -- are joined by the unmistakable touch of Eddie "Bongo" Brown's rhythmically limber congas. The record buying and radio listening public obviously agreed as the song was edited and issued on a 45 rpm that made it to the Top 15 R&B Singles survey. Returning to the project's thematic motif, "Someday We'll Have a Better World" is a midtempo optimistic number with a plea for a more peaceful co-existence. It even goes so far as to directly reference the violence -- presumably domestic as well as in Vietnam -- when Kendricks pleads for a time when "...we won't have to destroy each other" and "men can lay down their guns." The project's title composition "My People...Hold On" is stunning on a completely different level as the artist reconnects with his musical heritage with a languid and methodical bed over which Kendricks raps, practically begging for sanity within the socially troubled African-American community. Soul Strut Top 10: Your Predictions? I love this album. Solid the whole way through. I run into EK records all the time, but rarely see clean copies of "People Hold On". I had copped one in the summer of 2005, then gave it up a few weeks later as part of the Heatrocks auction. Haven't see one since, except for the time a few years ago, when I was at a store looking through the H section, and I saw a dude down the way pull out a copy out of the K section and add it to his pile. Grrr. Any, great record and deserving of SS Top 10 status. BTW, didn't someone on here end up buying the chair on the 'Bay (Cosmo?)? Yes! Every track a winner. Just listen to Date With The Rain. Just listen to it. Yes! Every track a winner. Also, If You Let Me is one of the best opening songs on an album ever. Sets the tone and never lets up. 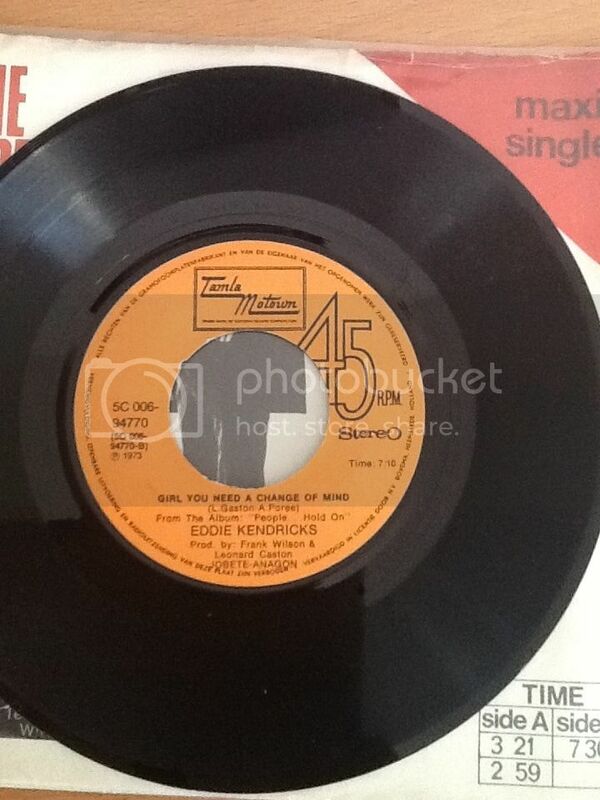 Does anybody have his next two albums, Eddie Kendricks and Boogie Down! respectively? I have the singles, but I get the impression that these LPs weren't as experimental as People...Hold On. If Kendricks played an instrument like Marvin or Stevie, I'll bet he would have continued to build on the promise of this album. As it was, I'm sure it was down to the whim of the producer and Eddie just went along with it. Proud to have this in my collection. "Date With The Rain" is an alltime top 10 for me and probably the best "soul dancer" imo based on my very limited knowledge. Odd thing about that track in particular is how well EK expresses anguish through the topic and his falsetto, and yet I always have a smile on my face when I sing along--probably because it's such a beautiful song. beautiful album, DWTR is one of my favorite 45s by anyone. re. the chair, WOW. Killer LP worthy of a top ten finish, Girl You Need A Change is the jam for me though. Euphoric end of night perfection and would love to have heard it at somewhere like the Paradise Garage. A couple years ago my girl and I were listening to almost nothing but this album. Stone cold classic. I never seen Girl You Need a Change Of Mind extended in the field. A buddy had it. And thats the last ive seen of it. your buddy had "Change Of Mind" on 12"? legit Motown? there's the Brooklyn Express version. I forget...but i debated whether there was even an extended version. He brought it to the party the next week. I dont recall looking at it. Is there a legit Motown 12" single? Lucked out and caught a 99 cent copy at a local chain store a couple weeks after they decided to sell used vinyl a few years ago. Great album. Love the track "let me run..". Anybody know if the "date with the rain" author, Bobby Miller, is the Chicago Bobby Miller that cut quite a few singles? I like the the way they flipped Girl You Need A Change Of Mind on this. Caught a nice, clean copy of this for less than $20 at Groove Merchant during a visit to SF about ten years ago. Never seen it for under ? ?30 in the UK, either before or since. A classic in all kinds of ways. The album version of Date With The Rain is great, but that 12" is exactly what an "extended version" should be all about. One of my go-to jams for years back when I was still DJing. this lp pops up constantly in the NY area for nothing. It seems as though it was a crate staple back in the day for everyone?? ?.for good reason. The album version is 7+mins too. The version he played was easily 9min. Dude probably had the Brooklyn Express joint that Johnny stated.